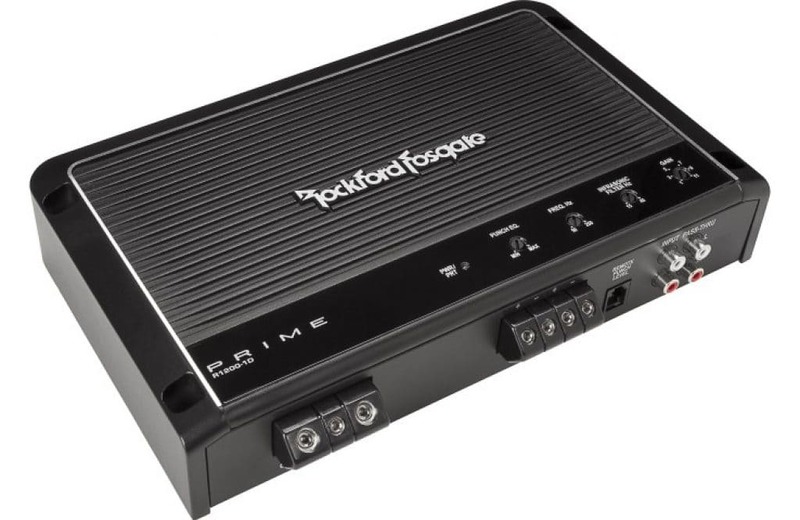 There are a ton of car amplifiers for bass to choose from – in fact there’s too many to pick from. What if you buy one and find out later you could have gotten a lot better deal? Just imagine how you’ll feel if you find out you got an amp that’s a bad pick or the power ratings are bogus. That’s where I’d love to help. I’ve put together a great list of the best car amps for bass for your dollar. Each one is a great deal for nearly anyone and have true power ratings provided. 3. Power ratings: What you really need to know! 4. What are Class D bass car amps? Why does it matter? Full-range and mono bass amps have pros and cons when you compare them. In fact one is best suited for a particular kind of audio system job. Mono amps are a better choice than full-range amps when you need only bass (like for subwoofers) and super power output. 2 and 4 channel car amps are better suited for musical use as their power output is usually more limited. One important thing to know right away is that mono bass car amps are not suited for full range speakers and are designed for high power output to subwoofers. While other amps how power ratings like 50W, 75W, or 100W per channel, a mono amp has a single high power channel. They’re often capable of power output like 250W, 350W, 500W, and even 1,000W and above! Nearly all of them aren’t equipped to produce the full range of musical sound frequencies. Unlike 2 and 4-channel amps, they’re also available in much higher power output ranges. While most car amps can be bridged, even then that extra power is lower than a lot of low priced bass amps. Full range car amps are designed with flexible crossovers for the most common speaker systems people use: Component speakers, separate tweeters or woofers, and full-range coaxial speakers. Bass amps are best suited for only driving subwoofers. One thing they do have in common, though, is that both kinds sometimes offer a bass boost feature to “bump up” the bass for even better sound. Bass amps often also included a remote bass level knob which most full-range amps don’t. Definitely bear that in mind when shopping. It’s a really convenient and cool feature to have! Shown: A typical high-power mono bass amp like often has a minimum speaker load rating printed on it (or in the manual). Never wire subwoofers in a way that the total Ohms load will be below this. These days many bass amps can handle an Ohm rating down to super-low values like 1 Ohm! This is in contrast to 2 and 4 channel amps as nearly all of those need at least 4 ohms when bridged and 2 or 4 ohms per channel depending on the model. The Ohms rating (the real name is impedance, the total speaker load the amps sees) tells you the minimum speaker resistance, also called the speaker load, an amplifier can handle. It’s important to never go below the smallest speaker load specs of an amp as it will get hot quickly and may shut off or could even become damaged. What does that really mean? It means you’ll be able to drive even more subwoofers if you like. That also means a lot more flexibility for your bass system options. Power ratings: What you really need to know! 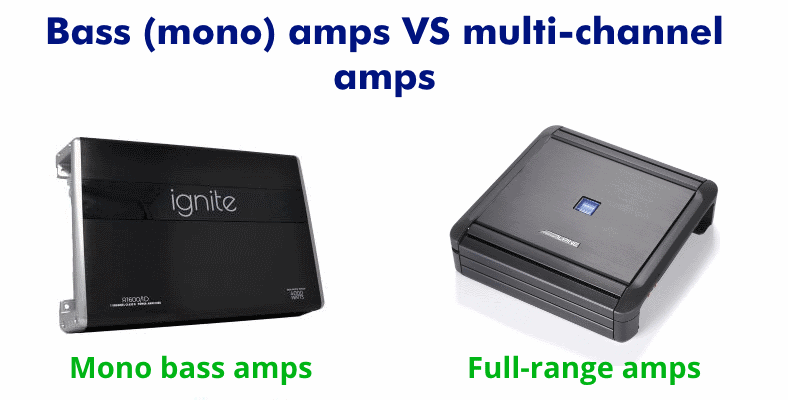 Unfortunately there’s a lot of misleading info used for selling car amps – especially for bass (mono) amps! The good news is that, generally speaking, once you know the basics and what to look for you can avoid getting ripped off. Thinking about buying a bass car amp to drive some subs? Chances are you’ve seen just how confusing it is when you look at car amp specifications. It’ll nearly give you a headache trying to figure out which ratings are the true power output and what it all means. It’s a shame but even today many amplifier manufacturers still use misleading power ratings. A lot of amplifier companies (especially for budget-priced models) rely on misleading numbers to sell amplifiers to unsuspecting buyers. What makes things even worse is that in some cases even if the listed power is reasonable there’s no way to know for 100% sure what it will really deliver in many cases. A lot of lower-priced car amps don’t use industry standard ratings to guarantee you’ll get what you think you will. Unfortunately while there is not a single reliable way to judge amplifier power in the world of car audio, there are a few things I can show you. The peak power rating, also listed as the maximum power, isn’t a useful number at all in the real world. This is the power rating used as a misleading number on many car amps unfortunately. This power rating is the maximum power output a car amp can produce only for a tiny moment – usually a fraction of a second. It’s not the power rating you can expect an amp to put out continuously. Don’t use this to make a buying decision! Root Mean Square (RMS) is just a mathematical way of calculating voltage and power for alternating current (AC) electrical signals produced by amps. That’s because unlike direct current (DC) your car uses from the battery, music has alternating sound signals which change direction (waves, like sine waves). Because of this, it’s a bit more complicated when we calculate the same amount of work AC does vs DC. The most important thing to know that the RMS power rating for an amp is usually assumed to be around the “true” continuous power rating it can really deliver. Sometimes you’ll see the words “continuous power” used and other times you won’t. 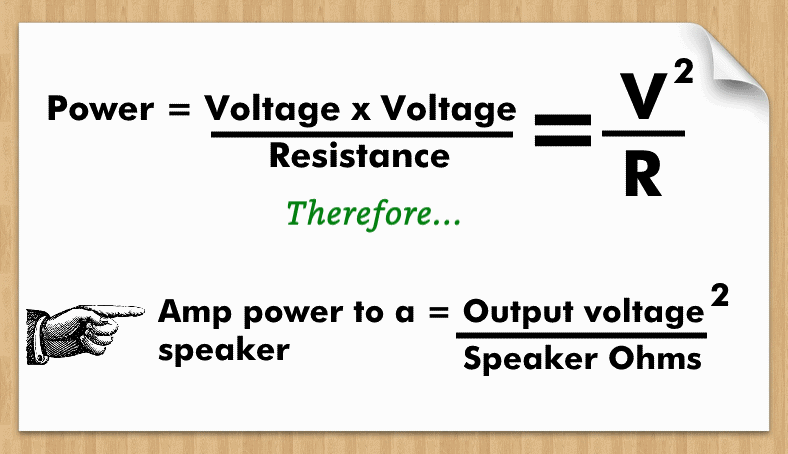 RMS power is usually measured based on the amp’s voltage delivered to a speaker load. It’s often (but not always) based on how much power can be delivered until speaker clipping – or when a musical signal starts to get cut off and distorts – happens. Because the audio electronics industry has such a big problem with specs and how they’re misrepresented, the Consumer Electronics Association (CEA) developed a standard way of rating amplifiers. 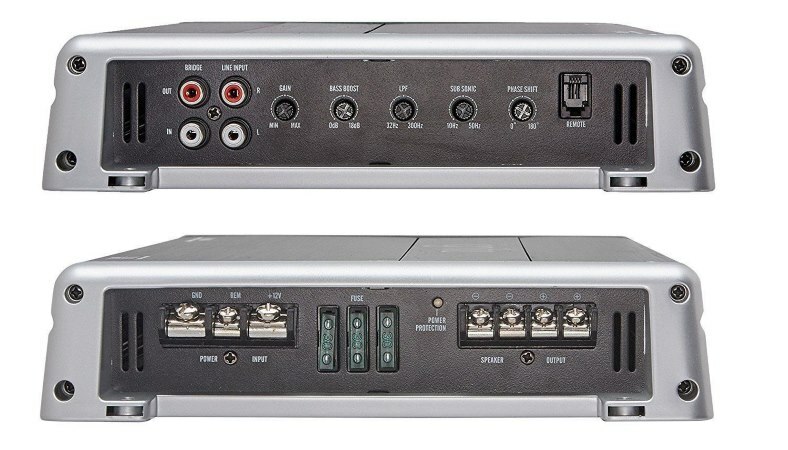 Called the CEA-2006 amplifier power standard, it’s a way of knowing that a company has real specs that meet the same requirements as those from another company. In other words, it’s a fair way of comparing one amp’s ratings to another. It’s just a different version of RMS power ratings. In fact, it’s actually a bit more strict, as instead of measuring an amps output until it reaches speaker clipping, power is measured until it reaches 1% distortion. Which power ratings should you use when shopping for an amp? For the most part, use the CEA-2006 power ratings (if available) or continuous RMS power ratings when buying an amplifier. A good quality amp should deliver the power ratings it lists for those. Never use the peak or maximum power ratings as a way to compare amps when shopping. What are Class D bass car amps? Why does it matter? This diagram shows the basic way a class D works and why they’re so efficient. Unlike older designs, they don’t turn on output transistors when a music signal isn’t present. Instead, they turn the input signal into a series of on/off square waves. These are then filtered and shaped back into the original (now amplified) signal then out to drive speakers. Class D amplifiers are a perfect match for bass car amps, as years ago super high power car amps were simple too expensive and used too much power to be affordable. They also produced a lot of heat when used. That’s not the case anymore. Thanks to modern class D technology bass amps can be much more efficient, smaller in size, and produce much less heat. In fact they’re a better value, too, as now they can produce more power for your dollar than ever before! These types of amps are more efficient than older class A/B amps as they use switching technology to “break up” a musical signal into a series of square waves. Because of this, the power transistors they use to amplify the inputs aren’t turned on except when needed and therefore don’t waste as much power as older amps. Before being sent to the subwoofer output, the original signal is amplified and turned back into the same shape as the input signal from your head unit. Class D car amplifiers are typically about 85% efficient and run cool unlike class A/B designs which are only about 65% efficient or less. A budget beast that delivers some serious class D power for under $100! 400W/800W/1200W CEA-2006 power. Built-in heat management feature. Only 1.97 x 6.77 x 11.06" in size. Includes Punch remote control. 1. 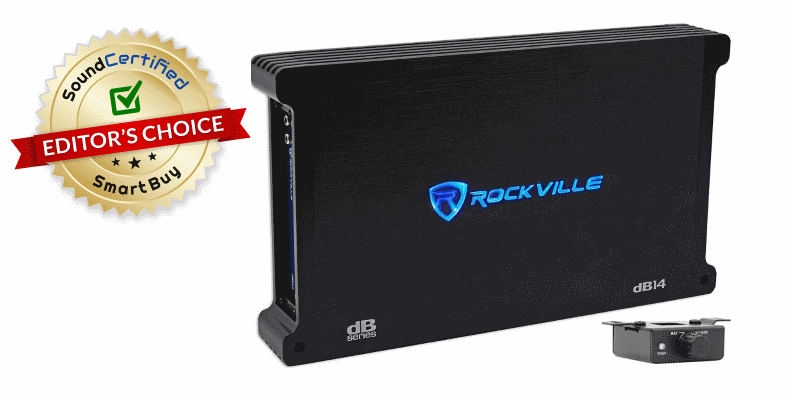 Rockville DB12 – Excellent CERTIFIED power and features for under $100. A budget beast! Need some real bass power that won’t break the bank? You’re in luck! 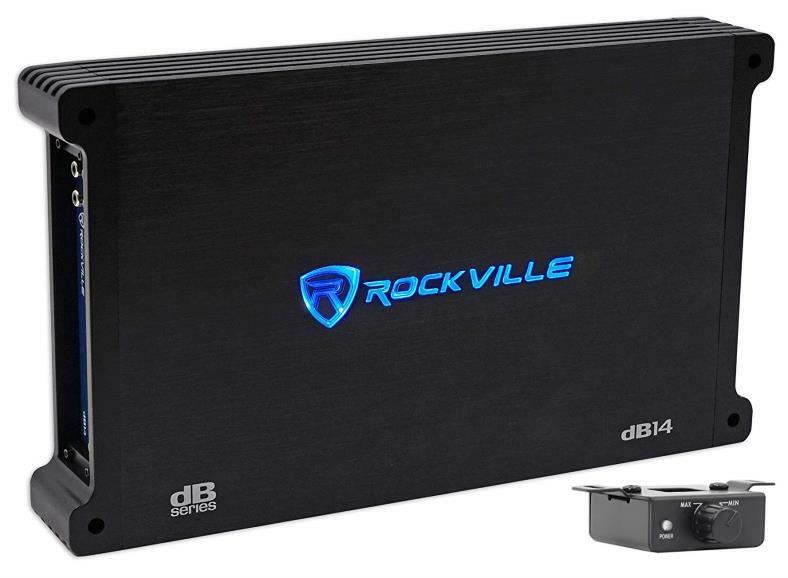 Rockville’s DB12 is one of today excellent budget beasts that has unbeatable value and power output. 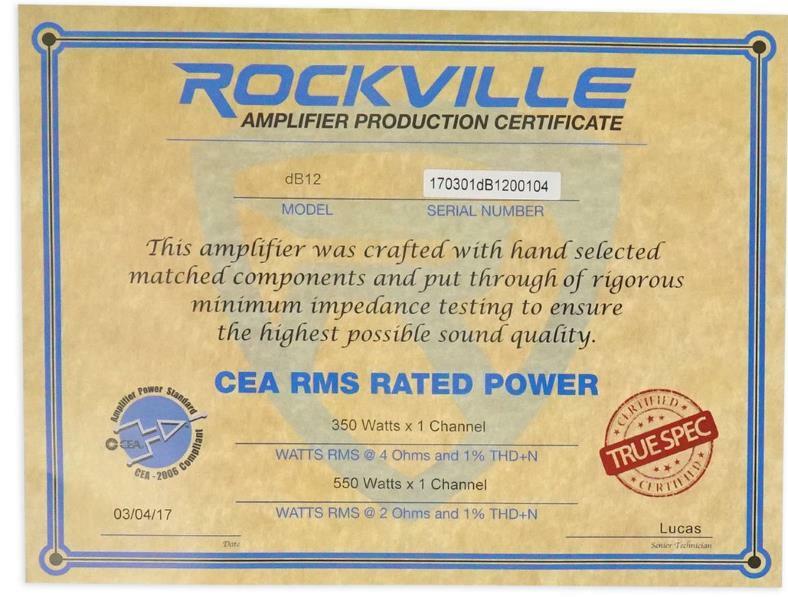 Unlike other budget-priced amps on the market, Rockville amps are rated using CEA-2006 industry standard true power specs with proven numbers. In fact, the non-CEA ratings (RMS) you’ll get are even higher. Not only that, but it’s a well-made one that I’m happy to recommend too. And quite frankly it’s simply a great sounding amp as well! Unheard of in budget amps, the DB12 includes a certificate with certified power specs. That’s unusual in this price range as normally it’s only found with more expensive amps. CEA-2006 compliant power specs mean you can be confident you’ll get the power advertised. Low price, great features. One thing I really like about the DB12 is that despite being so affordable you still get the great features you need for hard-hitting, clear bass. 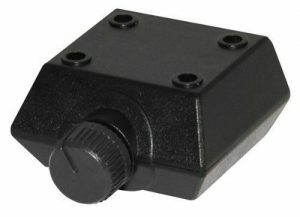 Speaker and wiring terminals are higher quality than other models in its price bracket and offer tight, clean, reliable connections. You’ll also get a bass EQ (boost) control, 0/180 degree phase switch, and adjustable low pass crossover. There’s also a bass remote port for the included remote bass level. RCA output jacks make system expansion even easier, too! I’m not just impressed by the great value of the amp but the features you get, too. I’m impressed that such an inexpensive, solid amp still offers features others don’t. This is not an amp you’re going to be able to match for the money, hands down. Without a doubt it’s one of the rare few to offer true CEA-2006 power ratings. 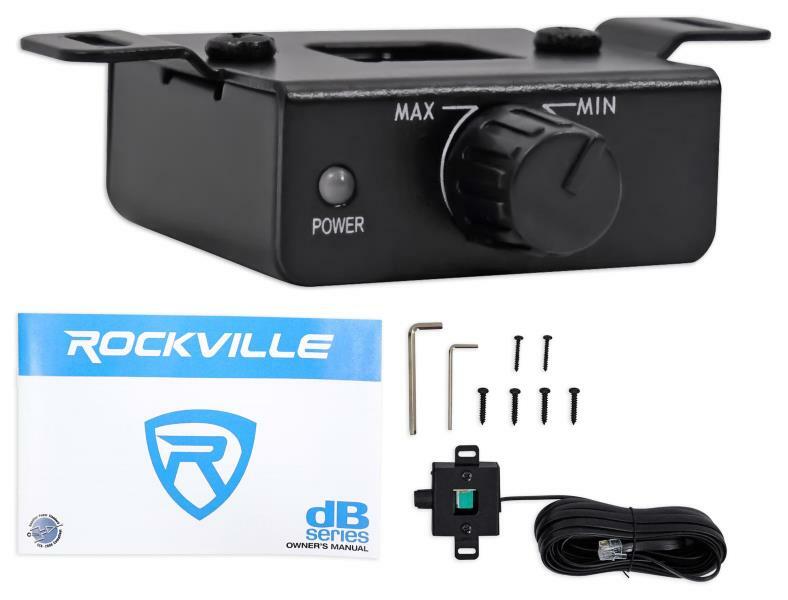 Your new DB12 amp comes with everything you’ll need aside from a wiring kit and audio signal: Hex wrenches, installation screws, the base remote & cable, and a helpful owner’s manual. 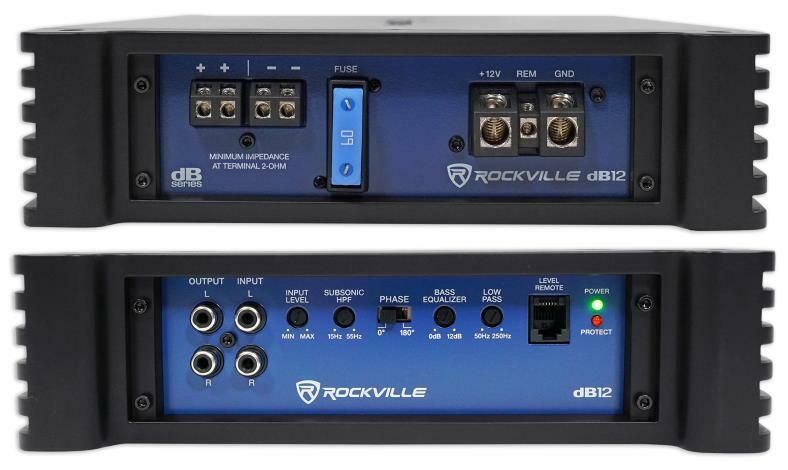 As much as I found the Rockville DB12 to be one of the best budget buys around, it’s not perfect. I do have a few minor complaints. Mainly, it can’t handle a 1 ohm speaker load (2 Ohm minimum rating) so you can’t drive some subwoofer setups like other amps. Also, if connecting to a factory system you’ll need a RCA speaker level converter as there’s no speaker-level input feature. Regardless, in my opinion it’s hands down an amazing budget beast that’s well put together and is a fantastic value. I’ve not often been impressed by an amp this affordable, but the DB12 has earned my Editor’s Choice recommendation. The facts are in: it’s an excellent budget bass powerhouse that’s affordable and ticks all the right boxes! This is a true budget beast you’d be crazy to pass up! Head over and check out the latest sale price and great reviews at Amazon. 2. Ignite R1600/1D – Lab proven power, great features, and low price. A true hidden gem. If you’re in the market for even more power that’s still very affordable (under $120) you’re in luck! 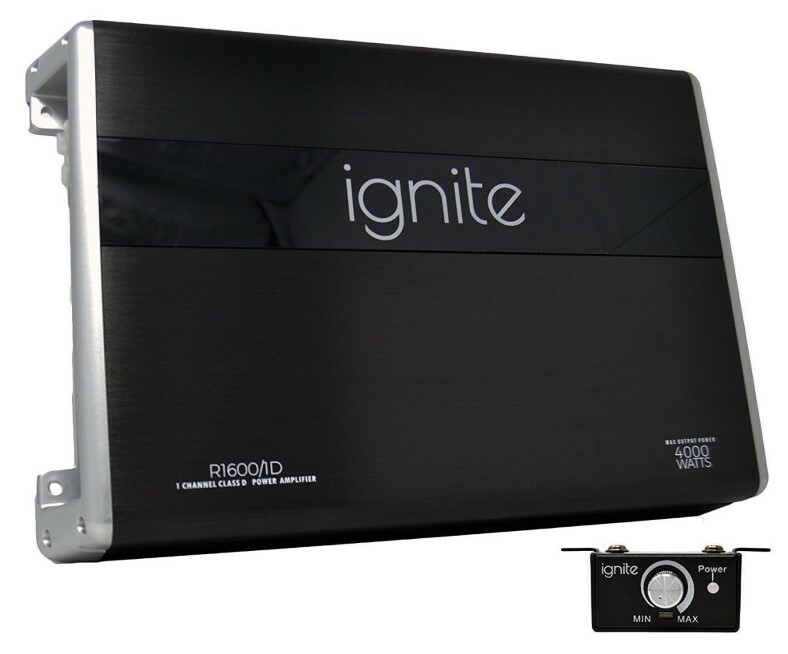 The Ignite R1600/1D is a nice little gem of an amp you won’t regret. Not only does the R1600/D provide proven RMS power ratings but it can actually exceed its listed specs! That makes an already great deal even better. These are real-world, dyno tested numbers – not just hypothetical stuff. It’s great for more demanding systems, too, and unlike many other mono bass amps it’s stable to 1 Ohm speaker loads. You’ll get awesome power in a compact, efficient amp that runs cool while delivering slamming bass. Hard to believe maybe, but true! An incredible 756W of real, useable power in an amp that’s less than $100. It’s also a great-sounding amp too. Dyno test power output results for the R1600/1D. As you can see, at a bit above 14V (where your vehicle will be at time when the engine is revved higher) the power output actually exceeds the listed power ratings! I was pleasantly surprised to see what the R1600/1D could to. 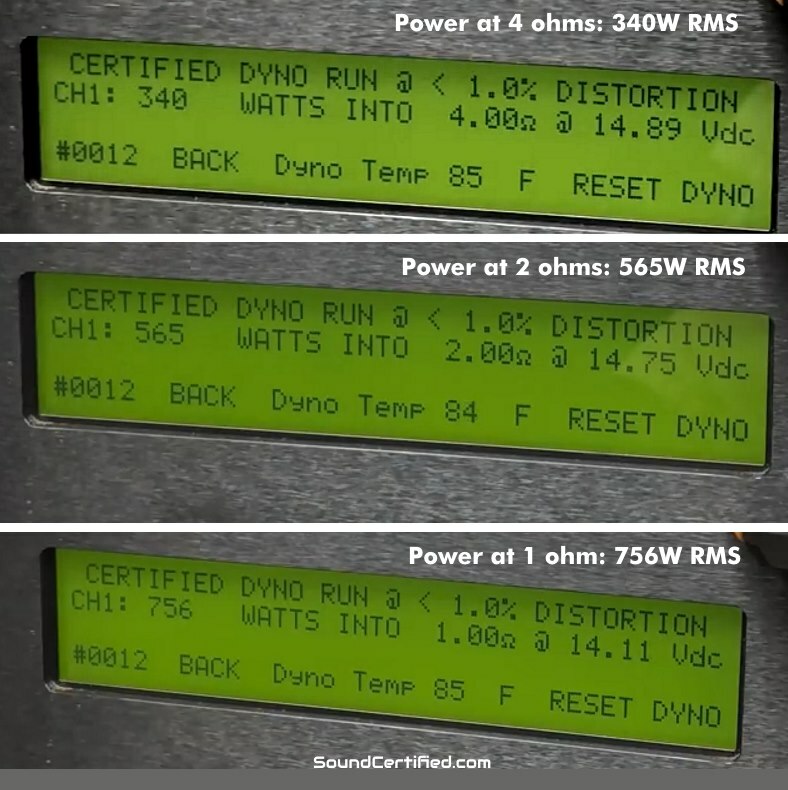 Dyno-tested (power/load testing measurements) power output for the amp at 4, 2, and 1 ohm loads show how well it works as you can see here. 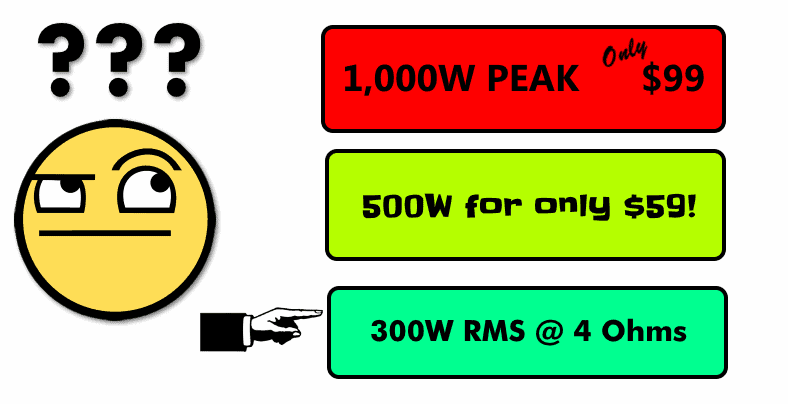 No misleading “peak” or “max” power ratings here: just real high power you can depend on. That’s some serious watts-per-dollar value. Don’t worry, though – you won’t have to compromise on features if you pick up an R1600/1D. It’s a well-made, smartly designed amp in my opinion. Good build quality & fit and finish. Want features? You got it! You’ll get a subsonic filter, adjustable bass boost, phase control, low-pass filter control, and bass remote port. There’s even an RCA output jack pair for system expansion. It’s a great-looking amp but it wasn’t just the power output and looks that impressed me. Unlike like other amps in its price range you’ll get some great features you might not expect. Remote bass remotes are a great feature you’ll love! Very convenient and they make using your bass amp more fun & easy. The R1600/1D includes one at no extra charge. Installation is easy and the remote works well – just dial in the exact amount of bass you want from the convenience of the driver’s seat. There’s also a neat little power indicator light, too. Nice! Bass remote controls are an awesome way to enjoy easy, fun subwoofer control from the driver’s seat, but not all amps offer one. However, the Ignite amp includes one at no extra charge. It’s an inexpensive, but well-made remote knob that works great and installation is easy. It also includes a power LED to let you know the amp is powered on and working. Just adjust the dial anytime for more or less bass – no need to fiddle with the amp in the trunk or your head unit! While it’s a fantastic performer and a great buy, I do have a few gripes: the mounting screws are a bit harder to drive in when mounting. The mounting feet are located facing the inside of the amp housing instead of outwards. Also, the wiring terminals aren’t as nice as those on competitors like the Rockville DB12. The amp is also slightly larger in size as well. No speaker level inputs are provided either. Otherwise, I simply can’t say enough good things and it’s a great choice. The Ignite R1600/1D is the perfect affordable starter amp. It’s a well-made budget gem with serious power output and value for your dollar. If you need serious bass power with good sound that’s affordable this amp should definitely be on your list. Find out now why its one of the top-rated and best bass amp values at Amazon. 3. 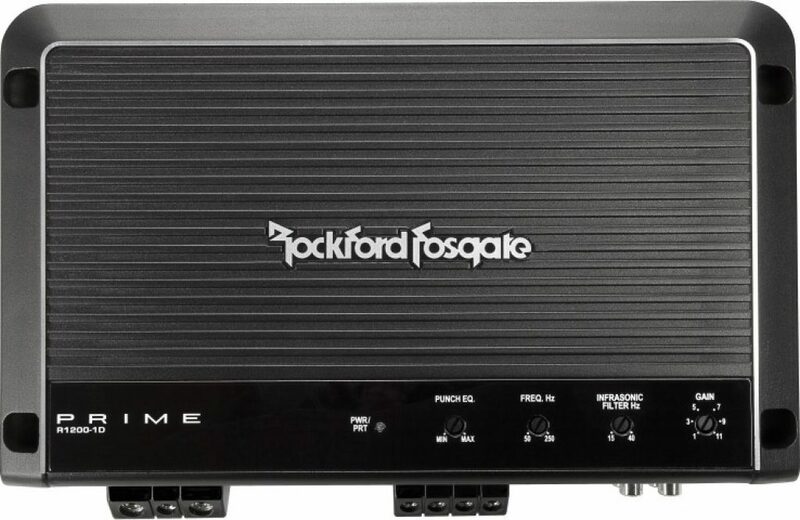 Rockford Fosgate Punch R1200-1D – Compact size, high quality, and AMAZING power: up to 1200W! 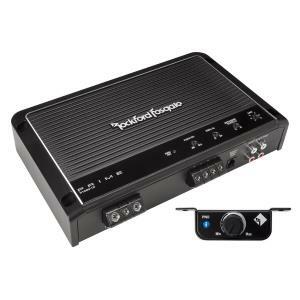 Rockford Fosgate is one of America’s top car audio manufacturer and it really shows. Their class D line of bass (mono) amps are some of the highest-quality you’ll find today. Each amp includes a unique verification sheet with CEA-2006 compliant test details from the factory before being approved for shipping. You’ll also get a great remote bass level control (no extra charge) for easy & convenient bass adjustment while driving. Top view: The R1200-1D is a sleek, well-designed compact bass amp with serious power output. Controls are easy to get to from the top making it a great choice not only for cars but trucks, too. It’s a solid, great performing amp you’ll love but what would a bass amp be without features? Need to tailor your sound just right? Use the Punch EQ bass boost to dial in a great amount of extra bass that really hits. Adding more amps? Use the convenient RCA pass through jacks to run cable directly to another and save time, hassle, & money. The R1200-1D comes with a great little bass remote and cable that makes enjoying your hard-hitting bass even better! Use it to dial in the perfect amount of thump anytime you like. No need to fiddle with your stereo’s bass control every time. It’s a great sounding little amp with excellent design quality, efficiency, and all the power you could need for about $250 or so. There are a few minor complaints I have: No speaker level inputs for factory systems and the mounting screw holes are harder to reach in this case. Also there’s no fuse built into the amp itself so it’s critical a good main battery fuse is used. Those minor points aside, it’s a super-powerful amp that can handle up to four 4 ohm subwoofers or two 2 ohm subwoofers without problems. The 1 ohm stable feature isn’t something you’ll find in a lot of other amps. If you’re in the market for a high-quality, reliable, and great-sounding bass amp with some serious power output, at 1,2000W RMS it’s a excellent choice. Be sure to see the other excellent buyer reviews today. Head over and see why it's one of the highest-rated mono bass amps at Amazon. Are you really strapped for cash and think you’ll just have to do without bass? Think again! 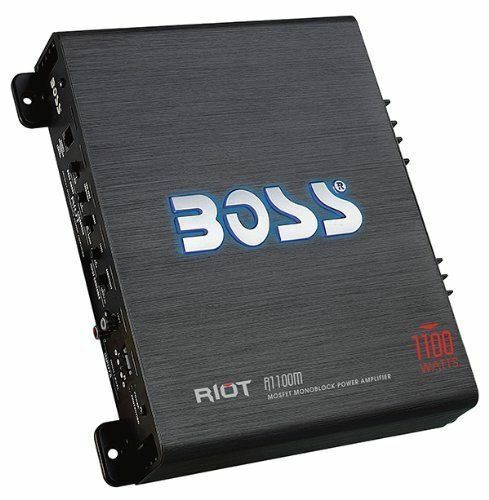 The Boss Riot R1100M is a best-selling cheap starter amp to help you get bass on a budget. One of the world’s most popular bass amps, the reviews don’t lie! I’ve decided to add this to my list of recommended bass amps because there’s a demand out there. Not even can afford even one of the great $100 amps I recommend. And hey, that’s ok if you don’t have the budget. 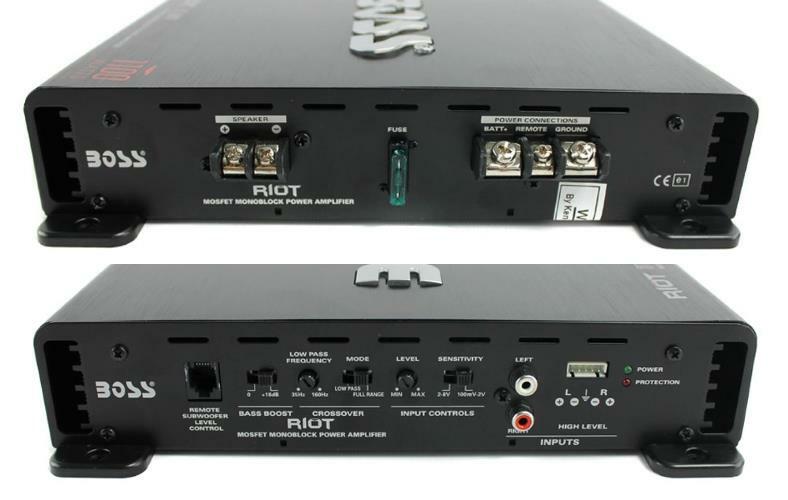 From Boss’ budget Riot amp family, the R1100M delivers some of the best value for the dollar. However, much like other budget models, the power ratings are misleading so here’s what you need to know. Does it have massive, ground-pounding power output? Not at all. However, it does well for budget systems where you don’t need expensive, high-dollar power. Yes, it’s cheap and definitely a budget amp! Regardless, if you’re ok with lower power output (close to 125W @ 4 ohms, ~200W @ 2 ohms) it’s still an option to consider. Despite being so cheap, it’s well-made and looks great. It’s definitely looks and feels a bit more expensive. Unlike some competitors, it features speaker-level inputs and can work with factory systems with no other parts needed. There’s a handy bass remote included. It’s a great feature I definitely recommend – very easy (and fun) to use while you’re driving for convenient bass control. Installation is pretty simple, too: Just click the included cable in place on both ends after mounting the bass control to your dashboard. As far as sound goes, it’s actually a pretty good sounding amp in my opinion, despite the lower power output. To make it even better you can switch on the bass boost or adjust the low-pass crossover control for better bass response. While not a great choice for huge, high-power subwoofer systems, it’s a great option for single or dual subwoofer box installations. I don’t often recommend lower end amps like this R1100M – especially those that don’t list the real RMS power ratings. However I can’t deny I’ve grown fond of it as a great choice for people who can’t spend a lot. You’ll get decent power for a good basic starter system, so don’t expect competition level bass that shakes your neighbor’s windows. If you’ve got limited cash it’s a good starter amp that’s incredibly affordable and has enough power for good, basic bass. Head over and check the current super-low price and thousands of happy buyers at Amazon. With great power comes the need for great wiring! Get a GOOD amp kit you won’t regret buying. An excellent example is the quality but budget priced Belva BAK82BL 8 gauge complete amp kit. Mono bass amps have some of the highest power output available so it’s important to supply them a solid, reliable high-current connection using good wiring. If you’re careful and shop smart you can get an affordable amp wiring kit with correctly sized wire that will make installation much easier. The Belva BAK82BL kit shown above is a high-quality option I recommend. It looks very professional when installed, too! Curious about how car amps work and what’s inside them? Check out my detailed guide about how car amps work here. 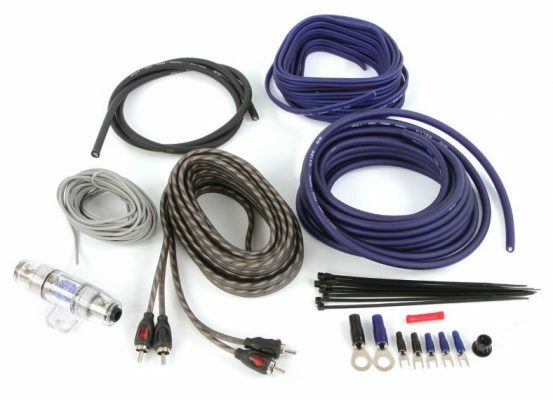 Need a good amp wiring kit? Check out my buyer’s guide and some excellent amp wiring kits for the money here. 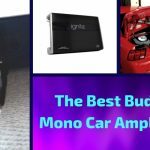 The Best Budget Mono Car Amplifiers Under $100 - 3 Affordable Gems!